Ships from and sold by JIA Trade. ❤ NOTE:Recently, there are unscrupulous merchants selling my goods. My shop is BB SELLER. 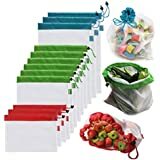 Please comfirm the store to buy, otherwise we will not be responsible for any of them.✔ 3 DIFFERENT COLOR CODED TAGS & TOGGLE CLOSURE: We created these with a different color coded tag for each size making it easy to organize your produce or anything else you use these bags to store. Each bag has a small toggle closure that keeps everything secure inside the bags. ✔ CONVENIENCE：Drawstring and poplock for conventient opening and closing. Easily Portable, Trouble Free and Hassle Free when bringing these along on your next shopping trip. 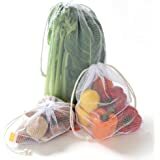 you can wash the produce directly in these bags and then place them straight into the fridge,less food wasted and great for the environment. 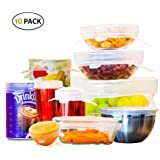 ✔ MULTIFUCTION：Transparent storage for travel items and almost any household item. Perfect for toys,fruit, coins, medicine, cables, cosmetics, accessories and much more. 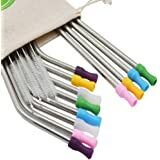 Use them to keep things together during grocery shopping,camping, fishing, garden harvest,beach and travels, etc. 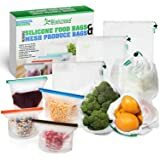 ✔ COMPLETELY TRANSPARENT, SEE-THROUGH MESH: Our mesh produce bags are lightweight and completely see-through, dont be fooled by other bags that claim to be see-through. 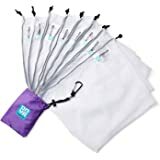 With these bags it easy to see whats inside the bags without having to open them. Each bag weight less than1/3of an ounce, so they add very minimal weight when checking out. ✔ DURABLE：Made of strong, lightweight, easy-to-see-through mesh polyester,Plastic-free & save the environment. Sold by Slider-Bagz and ships from Amazon Fulfillment. Sold by YCIT and ships from Amazon Fulfillment. 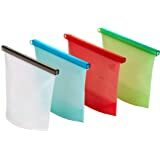 The Reusable Grocery Produce Bags in 3 different sizes. Breathable mesh design instead of sweating inside the store's plastic bags. 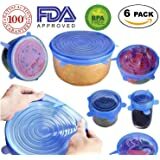 Washable and reusable for grocery and storage. If you are not fully satisfied with your purchase we will give you a full refund. 3.0 out of 5 starsMaybe there are better bags?? I like it comes with 3 different sizes. Small, Medium and Large. These bags are great so I don’t have to use the single use fruit and veg plastic bags. The sizes are great as well. 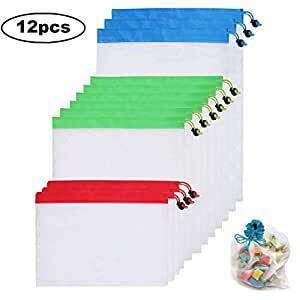 I use these now and never have to use the bags again. Perfect! I am sick of all those thin plastic bags from the supermarket. I can never find other uses for them. These are great. Step by step and I am transitioning to reusable everything. I love these bags. I take them with me grocery shopping and use them instead of the store's plastic bags in the fresh fruit and veg section. 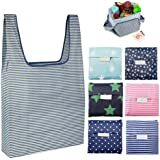 For those that want to be environmentally friendly and get away from using single use plastic bags for fruit and veg at the grocery store. Great alternative and washable. I like using these when I go shopping. No plastic bags required. I feel like I am helping the environment even just a little bit.